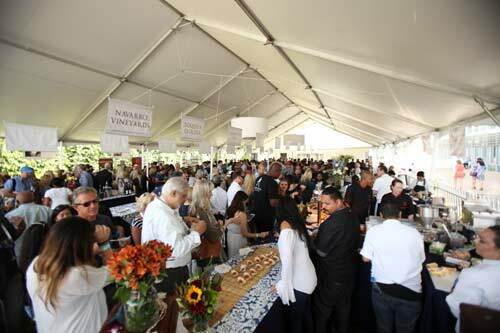 Though the Newport Beach Wine & Food Festival is an early October event, you better get on your tickets now. The fifth annual event is Oct. 4-7, and despite additional events and partners this year, several exclusive happenings are already sold out, such as the opening-night dinner at Pelican Hill and the Champagne and caviar tasting. This festival is a foodie and wine aficionado’s delight. I often subjectively surmise wine events are a dime a dozen, but the Newport Beach Wine & Food Festival is a special treasure. Want to dine with Hubert Keller or learn tips and tricks from your “Top Chef” alum? You can! Want to discover the science, history, and religion of imbibing? You can. Want to leisurely eat your way through Orange County’s best bites with a glass of fine wine in the other hand? You can. My inaugural experience was in 2017, and I was profoundly impressed at the wine, food, atmosphere, music, and diversity of experiences. My headline after attending read “I Needed Two Days at the Newport Beach Wine & Food Festival.” My one day of Grand Tasting left me longing for more time and more experiences. Fire It Up at Balboa Bay Restaurant – $125 per person, 2-5 p.m. Oct. 5. My lure was cemented with the notation of the event’s barbecue theme and the appearance by Joe Flamm. As a “Top Chef” addict, I loved Joe Flamm’s cooking, which on TV felt extremely approachable, elegant, and soulful in his “Top Chef” victory this season. I’m also a huge barbecue fan and drawn to any foods with a smoky essence. You’ll also interact with Keller, Christopher Scott, Fatima Ali, and more. 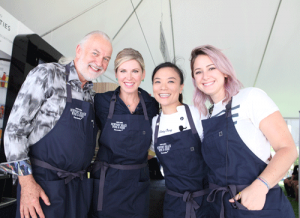 Take a half day off work that Friday and don’t miss this extraordinary opportunity to rub elbows and sticky barbecue fingers with the culinary world’s top talents. Celebrity Chef Twilight Cruise – $150 per person, 7-10 p.m. Oct. 5. So, you ditched work and family to hit the Fire It Up event and still have that yearning for more? Hop on the Sunset Yacht Cruise featuring fantastic pours, celebrity chefs, and even Duff Goldman’s band called Foie Grock. Grand Tastings – $150 per person, 3-6 p.m. Oct. 6 and 7. The festival at the Civic Center is like Christmas morning for me with shiny glasses, bottles popping, and plentiful delicious bites. But, be careful: Your cup may soon runneth over. I was so giddy with the extensive variety and opportunities for eating and drinking that I was livid when my body declared itself “full.” This is the main reason I recommend attending both Grand Tasting days – so you can sip, savor, share, dance, and soak in the pure joy of this fall weekend.